The Rangers - notoriously terrible in weekend matinees - bucked the trend to beat the exhausted Anaheim Ducks 3-0 on Sunday evening. They came out firing and battered J.S. Giguere with 13 first period shots. Anaheim managed just one before the adrenaline started pumping in the second period. The Ducks rose to the Rangers challenge but couldn't get the puck past Steve Valiquette and a surprisingly composed Ranger defense. The second intermission took the wind out from under their wings and Anaheim got sloppy. 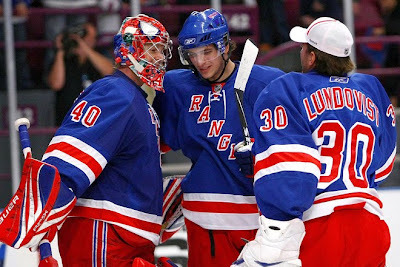 Two power play goals spelled their doom as the Rangers rolled to their fourth straight win. Holy s%^&, I just wrote that. Fourth straight win. The Rangers. These Rangers. Consider me surprised. But there was little shock that the Ducks were easy to hunt after their draining battle with Philly on Saturday. A bigger test will be Toronto tonight, as they are fresh, hungry and physical. *Speaking of physical, Vinny Prospal was 10 times more physical than Donald Brashear. Prospal played some motivated pucks and stayed involved. His feed to Arty for the Russian's first NHL goal was a work of beauty and, as my buddy Angelo said, he and Gaborik clearly carried Brandon Dubinsky. *Dubi missed several good chances and seemed to enjoy watching his linemates as much as us fans. Not a good thing. And that late high stick wasn't good either, even if it did lead to Dan Girardi's shorthanded empty netter. A team with more gas left in the tank could have made the most of it; the Ducks certainly weren't up to it. *Girardi was fantastic. Well, after his shot on Valley early in the first period. He threw his body around, was great positionally and looked like the pre-Redden version of himself that was headed towards stardom. *One of these days Chris Higgins will convert on one of his chances down low. It is going to happen. It has to happen. He is so involved and gets himself the puck in good spots but has been stoned time after time after time (sounds like an old roommate I used to have ...). *At one point in the third period Brian Boyle lost his stick. He fell to the ice and shoved the puck along with his glove. Seeing a teammate nearby, with a Duck closing on him, he got half up and kicked the puck towards the teammate - avoiding the hand pass. It was a little play, but it was a smart play and certainly rose my opinion of him a few notches. *If you have actually read this far, you are kind of wondering about Sean Avery. Well, Avery finally made his season debut and he was ... (wait for it) ... awesome. Dallas' problem is clearly our solution. Sean just does it all. He mixed things up, went to the net, forced the puck deep, didn't do anything dumb and made some perfect passes. He nearly got Arty his first NHL goal with a centering pass in the second and then did get him it with a pretty drop pass to Prospal that was one-timed to Arty for the power play goal in the third. Go Sean! *And before I call it a night, best wishes to Todd Marchant. That was one hard fall into the boards for the former Blueshirt. Always liked that guy, hope he heals well/fast. 3-Vinny Prospal - one assist. 2-Ales Kotalik - one goal. 1-Steve Valiquette - 18 saves. 3-Valley - All that you ask from your backup is that he come in and give you a chance to win. Valley did that and more. He stood tall in the Ranger net and shot down the Ducks. Plus, maybe it was me, but he seemed to be coordinating the defense a lot more than he has in the past. 2-Giguere - Jiggy had no shot at stopping either of the goals against him. Sure, he was beat four other times when the Rangers hit the post but he still made 35 saves and looked a lot better than his teammates. 1-Avery - Prospal was great, Girardi was awesome but neither one was under the microscope of Avery. The building cheered for him when he stepped on the ice. The building cheered for him when he made his first hit. The building cheered when he took his first shot. And he raised to the occasion. Yeah Sean! Arty is playing well. I know he's only got one goal, but he should have gotten Kotalik's goal against Washington too. If you watch, he makes a great pass to Kotalik and then crashes the net for the give and go. Kotalik backhanded it himself instead of passing back to Arty and, frankly, got really lucky that it went in.. Arty was in perfect position for a tap in. I give him a virtual goal for that effort. Rangers played well against a quality team. I am enjoying what I am seeing so far. The true test will be how well they play on Thursday after this stretch of 3 games in 4 nights. How about the third periods so far? They are an offensive force. I'm not feeling nostalgic for last year's Renney version or even last year's good start.